Every Veterans Day since 2008, Applebee's restaurants have been thanking veterans for their service by giving them a free meal. It's so popular that it's one of Applebee's busiest days of the year. 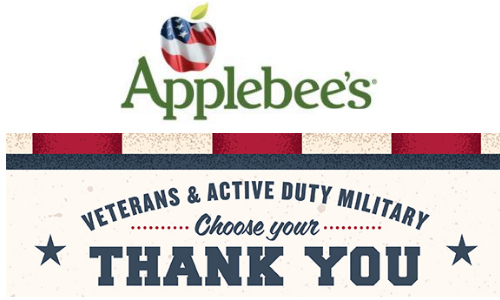 Since 2008, Applebee's has given away over 8.3 million free meals to veterans and active duty military! This year, they expect to server around 1 million more. Available on November 11, 2018 at participating Applebee’s® only. Beverages and gratuity not included. Veterans and active duty military simply show proof of military service. 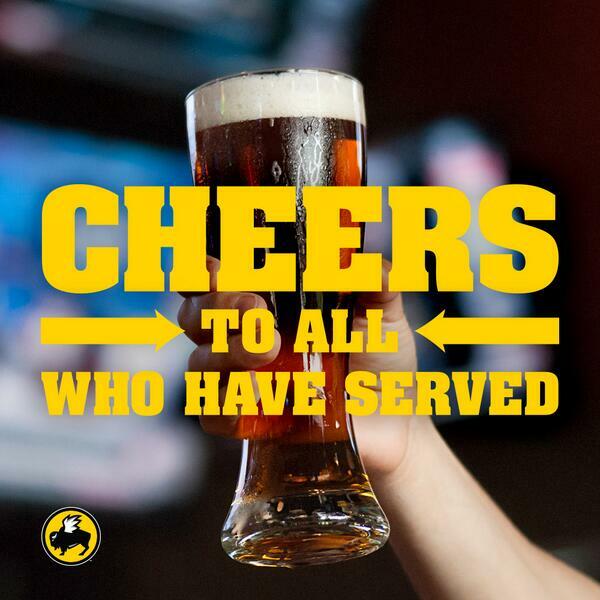 Limit 1 meal per veteran or active duty military. Dine-in only. Not valid with other coupons or discounts. Menu may vary by location. This Veterans Day, Back Yard Burgers is handing out free burgers to veterans and anyone actively serving in the military. Back Yard Burgers offers a 20% discount to service men and women all year as well. On Saturday, Nov. 11th all active and retired service members with a valid military ID will receive a complimentary Bang Bang Shrimp at all Bonefish Grill locations. Buffalo Wild Wings will once again honor the brave men and women who serve and protect our country through its “Wings for Heroes” in-restaurant offer. On Saturday, November 11, 2017 all Buffalo Wild Wings restaurants in the U.S. will offer a complimentary order of wings with a side of fries to active and retired armed services members. All veterans receive a free Chick Meal and Drink on Nov. 11th. Active military members, veterans and military spouses with ID can stop by any Chipotle restaurant for a buy-one-get-one-free burrito, bowl, salad or order of tacos. This offer is valid from 5 p.m. to close, and is open only to those with proper identification. Veterans can receive one free personal 1-topping pizza on Nov. 11 with military ID. Cracker Barrell will offer veterans a complimentary piece of Double Chocolate Fudge Coca-Cola Cake for dessert on Veterans Day. Between Oct. 30 – Nov. 11, Cracker Barrel will donate 20 percent of proceeds from online and in-store purchases of Lodge cookware to Operation Homefront. On Monday, Novembe 12th, in observance of Veterans Day, participating Denny’s locations nationwide will offer a complimentary Build Your Own Grand Slam to service members. The offer is valid from 5 a.m. to noon with a valid military ID. Dunkin Donuts will give veterans one free donut on Nov. 11. Limit one per guest while supplies last. Fazoli's is showing support to our nation's heroes this Veterans Day by offering all active, inactive and retired military personnel a free spaghetti with marinara or meat sauce, no purchase necessary with an I.D. or in uniform. This offer will run all weekend from Friday, November 9th through Sunday, November 11th. In addition to the Veterans Day weekend offer, Fazoli's is rolling out an ongoing year round discount program for veterans by offering ten percent off any purchase with a military I.D. or in uniform. 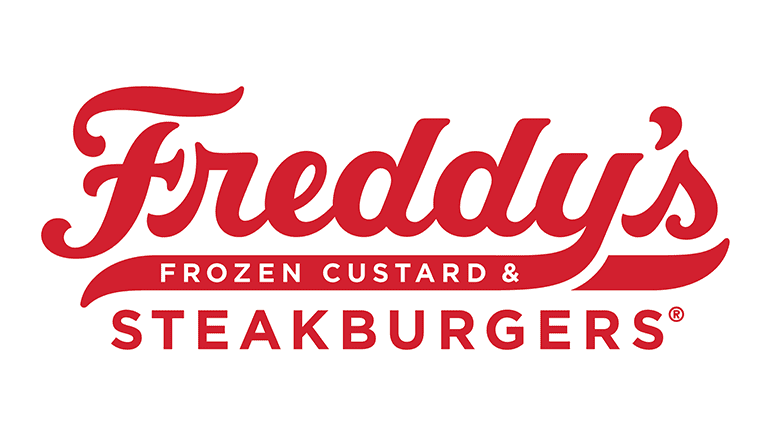 Visit a Freddy's Frozen Custard & Steakburgers near you this Veterans Day, November 11, to get a free combo meal card. You must be a veteran or active duty military to pick up the card but it can be redeemed by anyone. All active duty and retire military can enjoy a complimentary meal at Hooters with the purchase of a beverage on Veterans Day. Diners can choose from 10-piece Traditional Wings; 10 piece Boneless Wings; Hooters Burger; Buffalo Chicken Salad; or Buffalo Chicken Sandwich. Hooters also invites guests to purchase a 2018 Hooters Calendar in support of Operation Calendar Drop. Hooters will collect and ship the calendars to U.S. military deployed in the United States and around the world. All active duty and retired veterans are invited to enjoy free Red, White and Blue pancakes on Friday, Nov. 10. Military ID or proof of service required. All veterans and active military personnel will receive a free doughnut and small coffee on Nov. 11th. All veterans and active duty military can receive a free sausage biscuit during breakfast hours. Veterans and military personnel can receive a free $5 Hot-N-Ready lunch combo on Veterans Day. LongHorn Steakhouse is giving away free appetizers and desserts to veterans and active service members who stop in to Longhorn Steakhouse on Sunday, November 11, 2018. You'll need to bring proof of service with you for this freebie such as wearing your uniform or showing Military ID. All veterans and active duty military personnel eat free at Olive Garden on Nov. 11. 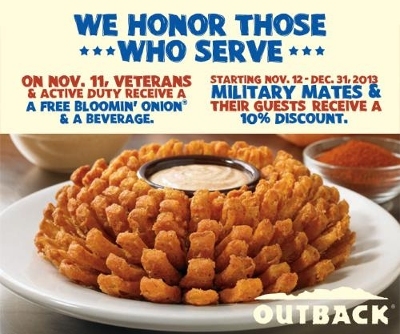 Veterans can receive a free Bloomin’ Onion and beverage on Nov. 11 with valid military ID. Red Lobster is offering a free appetizer or dessert on Nov. 11 to all veterans, active duty military and reservices. Guests only need to show a valid military ID or proof of service to redeem this offer. Starbucks will be giving away a Free Tall (12 oz.) Brewed Coffee to all veterans, active duty service members, and their spouses at participating locations in the U.S on Veterans Day, November 11th. 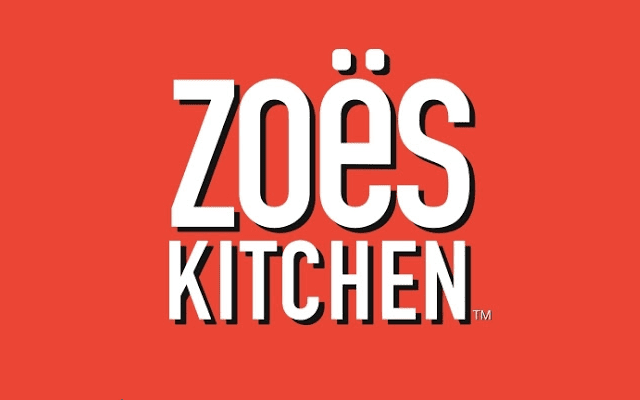 Zoës Kitchen is offering a free entree to all veterans and active members of the military. 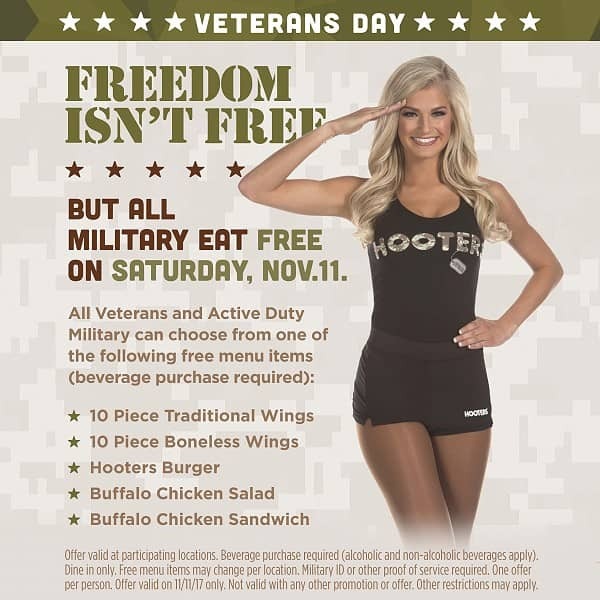 To get their free entrée, veterans and active military members must present their military ID at checkout.